This issue includes a first printing of the landmark Supreme Court decision in the case of Osborn et al. v. The Bank of the United States. 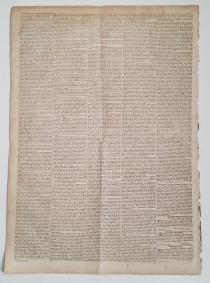 The Court announced its decision on Friday, March 19, 1824, and this printing appeared on Monday, March 22. [JOHN MARSHALL]. Newspaper. Daily National Intelligencer, March 22, 1824. Washington, DC: Gales & Seaton. Opinion for the Supreme Court in Osborn et al. v. The Bank of the United States fills pages 3 and 4. 4 pp. “At the close of the argument, a point was suggested, of such vital importance, as to induce the Court to request that it might be particularly spoken to. That point is, the right of the Bank to sue in the Courts of the United States. It has been argued, and ought to be disposed of, before we proceed to the actual exercise of jurisdiction, by deciding on the rights of the parties. “1st. That the act of Congress has not given it. “in all cases where jurisdiction depends on the party, it is the party named in the record. During the Banking Crisis of 1819, many banks, including the Second Bank of the United States, demanded repayment of loans, leading to a shortage of money. In February 1819, the Ohio state legislature passed a law to collect a tax on any banks operating within the state contrary to the laws of the state. It also authorized state Auditor Ralph Osborn (1780-1835) to charge $50,000 for each office of any such bank after September 15, 1819, and to seize assets to pay such taxes. On September 14, 1819, the Bank obtained an injunction in the U.S. Circuit Court of Ohio to prohibit Osborn from seizing funds from a branch of the Bank in Ohio. Despite the injunction, Osborn’s agents seized $100,000 from the Bank at Chillicothe on September 17 and placed $98,000 in the state treasury. Osborn used the remaining $2,000 to pay his agents. The Bank sued Osborn and the state treasurer for the return of the money, and the U.S. Circuit Court ruled against Osborn and the treasurer and ordered them to restore the $100,000 to the bank, with interest of $19,830. The circuit court ruled that Osborn had violated a court order, which prohibited the taxing of the bank. Ohio defended its injured sovereignty, endorsing the Virginia and Kentucky Resolutions of 1798. The stage was set for a classic confrontation between the claims of state sovereignty and federal supremacy. In March 1819, Chief Justice Marshall’s Opinion for the unanimous Court in McCulloch v. Maryland had established that Congress had power to create the Bank of the United States, and that State taxation of the Bank was unconstitutional. Ohio sought to skirt McCulloch by arguing that the Eleventh Amendment blocked the Bank’s suit against Osborn because he was a state official and acted for the state. Osborn then appealed to the U.S. Supreme Court and argued that the U.S. Circuit Court should not have exercised jurisdiction over the case because Congress did not give it that right and that Congress could not give it that right under the restrictions imposed by the Eleventh Amendment. The Eleventh Amendment, passed by Congress in 1794 and ratified by the necessary number of states in 1795, gave states sovereign immunity against suits by citizens of another state or citizens or subjects of a foreign country. In March 1824, Chief Justice Marshall, in his opinion for a majority of six, quickly disposed of both objections to the jurisdictional questions. The Court held that Congress could grant original jurisdiction to federal courts in any case arising from federal laws, treaties, or the Constitution, and that the Eleventh Amendment applied only to states and not to their agents and officials such as Osborn. The Court ruled in favor of the Bank and ordered the state treasurer to return the $98,000 and Osborn to return the additional $2,000 though not the interest awarded by the Circuit Court. Associate Justice William Johnson (1771-1834) of South Carolina dissented from the Court’s decision. Appointed by President Thomas Jefferson in 1804, Johnson developed a reputation as a frequent and articulate dissenter from the Federalist majority under John Marshall. Johnson insisted that Congress could not create federal jurisdiction just by granting the right to sue in federal court. The cause of action had to arise under federal law. 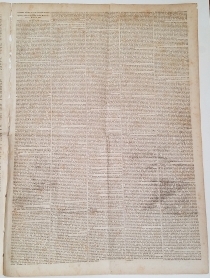 This issue also includes “An Act to define the boundary line between the Edwardsville and Springfield Land Districts, in the state of Illinois,” signed in type by President James Monroe, Speaker of the House of Representatives Henry Clay, and Vice President and President of the Senate Daniel D. Tompkins (p2/c1); the proceedings of Congress (p2/c2-3); a notice that because of the great length of the decision in Osborn et al. v. The Bank of the United States, it would not appear in the three-times-a-week edition, but copies would be available at the newspaper’s office for five cents (p2/c5); an advertisement for a meeting of the Board of Managers of the American Colonization Society (p2/c5); an offer of a $10 reward for the return of a young slave woman who had run away from a Virginia owner (p1/c4); and other advertisements and notices. Full Text of Opinion in Osborn et al. v. The Bank of the United States. John Marshall (1755-1835) was born in Virginia, and served in the Continental Army during the Revolutionary War. Furloughed in 1780, he began attending the College of William and Mary, where he read law with George Wythe. He won election to the Virginia House of Delegates in 1782 and practiced law in Richmond. He strongly favored the new federal Constitution and served in the Virginia ratifying convention of 1788. A strong Federalist, he accepted appointment as part of a three-member commission to France in 1797 that ultimately led to the XYZ Affair and the Quasi-War with France. Marshall won election to Congress in 1798 and took office in December 1799. In May 1800, President John Adams appointed him as Secretary of State, and Marshall negotiated an end to the Quasi-War. In the final months of his presidency, Adams nominated Marshall as Chief Justice of the U.S. Supreme Court, and Marshall took office in February 1801. As Chief Justice over the next thirty-four years, Marshall established the Supreme Court as a co-equal branch of the federal government, and he personally wrote about half of the more than one thousand opinions handed down by the Court during his tenure. 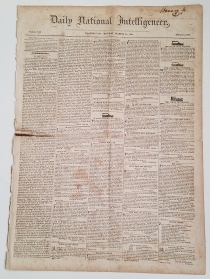 National Intelligencer (1800-1870) was a prominent newspaper published in Washington, D.C. In 1800, Thomas Jefferson, then vice president and a candidate for the presidency, persuaded Samuel Harrison Smith, the publisher of a Philadelphia newspaper, to open a newspaper in Washington, the new capital. 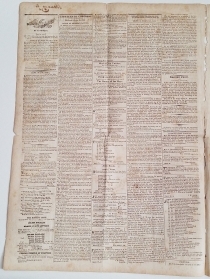 Smith began publishing the National Intelligencer, & Washington Advertiser three times a week on October 31, 1800. In 1809, Joseph Gales (1786-1860) became a partner and took over as sole proprietor a year later. From 1812, Gales and his brother-in-law William Winston Seaton (1785-1866) were the newspaper’s publishers for nearly fifty years. From 1813 to 1867, it was published daily as the Daily National Intelligencer and was the dominant newspaper of the capital. Supporters of the administrations of Thomas Jefferson, James Madison, and James Monroe, Gales and Seaton were the official printers of Congress from 1819 to 1829. 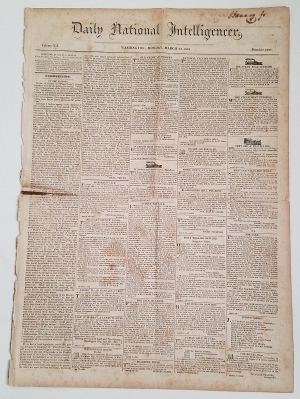 From the 1830s to the 1850s, the National Intelligencer was one of the nation’s leading Whig newspapers, with conservative, unionist principles. Loosened at spine, scattered light foxing. Pinhole at last leaf costs two letters. Very Good.